Milan, 17 March 2016 - Prysmian Group, world leader in the energy and telecom cable systems industry has gained verification of its higher voltage cable system technology for offshore wind inter-array networks. The Group announces the successful completion of type testing of its 66 kV cable system in accordance with CIGRE and IEC test protocols, as part of the Carbon Trust’s Offshore Wind Accelerator (OWA) programme. “This new qualification milestone is a further advance along our path towards the development of innovative, sustainable and cost effective cable solutions for the offshore renewable power industry” stated Raul Gil, Prysmian PowerLink Chief Operating Officer “Prysmian is both prepared and fully geared to support the global offshore wind market, such as the UK’s Round 3 project opportunities”, he added. The Carbon Trust is an independent UK company with a mission to accelerate the move to a sustainable, low-carbon economy. The OWA is Carbon Trust's flagship collaborative RD&D programme, involving nine offshore wind developers and supported by the UK Department of Energy and Climate Change (DECC) and the Scottish Government, which aims to reduce the cost of offshore wind through innovation, developing innovative concepts into commercial solutions. Among the prioritised technological challenges, the OWA identified higher voltage electrical arrays as an area for development which could deliver significant benefits to the design of future offshore wind farms. 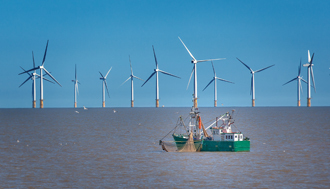 As has been reported elsewhere, developers can expect to reduce their overall offshore wind farm capital expenditure by up to 15% by raising the inter-array voltage level to 66 kV. Moving to 66 kV would demonstrate a material improvement in lifecycle costs compared with 33 kV, which becomes increasingly attractive as wind turbine continue to develop in size. To encourage an accelerated development of a competitive 66 kV cable system market, the OWA supported selected cable manufacturers, including Prysmian, with the testing and certification of their 66 kV cable system designs. Prysmian has now type tested a 3-core, 66 kV EPR insulated “wet-design” cable system with aluminium conductor - copper is also available - and integrated optical element. The solution includes factory, field joints and plug-in terminations (using proprietary Click-FitTM technology) and combines the use of state-of-the-art EPR insulation - a material with excellent performance in direct contact with water, with the cost effectiveness of a lighter, lead-free design. The qualification process was carried out in Prysmian laboratories in the UK and in Italy. Although the qualified cable technology is innovative in its application, Prysmian has experience of over 40 years with such “wet design” EPR insulated cables up to 72.5 kV in a wide range of applications. This success in the qualification of its 66 kV system will provide the necessary confidence to offshore wind developers to reap the benefits by raising their inter-array system voltage to achieve significant overall cost reductions and a higher competitiveness of offshore wind energy systems.